Product #21122 | SKU IQ7 | 0.0 (no ratings yet) Thanks for your rating! The iQ7 comes with a removable spacer that allows it to be used with most iPhone, iPad, and iPod cases. 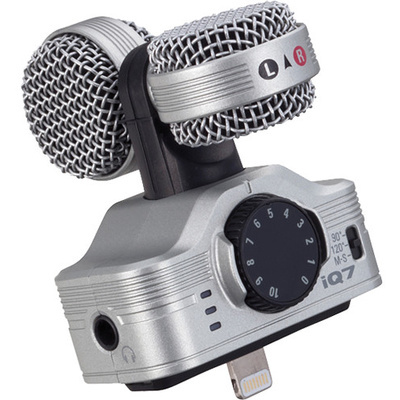 The mic is compatible with Zoom's free Handy Recorder app, which gives you the option to record as PCM or AAC files, and offers effects such as compression, AEQ, and reverb. Additionally, it will work with Apple's Voice Memo app and GarageBand, as well as most apps that support input from an external microphone. Zoom's free Handy Recorder app, available from the iTunes App Store, adds a wealth of audio tools to your iOS device. Overdub to the stereo recordings created with your iQ7. Perform fine editing functions in its waveform display. Save your files in either linear PCM or AAC file formats. Apply onboard effects such as compression, AEQ and reverb to further enhance the sound. Handy Recorder even allows you to email the audio you create and to upload it to SoundCloud for sharing with the world.